Let’s face it, enjoying and collecting fine wine is an expensive hobby, especially in light of a tanking economy. My Italian father has only bought a few bottles of “real” wine in a proper wine shop over the years, but he consumes two-three glasses of wine each night. You’re probably asking yourself at this point: well, how does he consume wine if he doesn’t buy any bottles? Well, pappa makes home-made wine and has been doing so for the last 35 years (in the US). 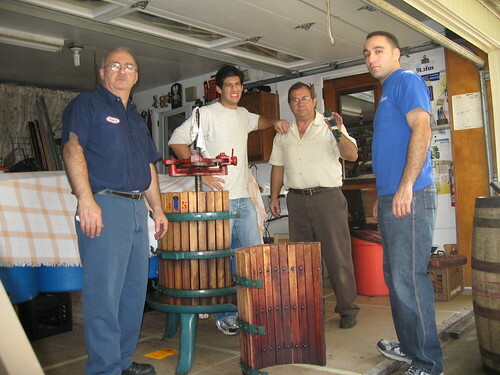 My father’s argument for making his own vino centers on: cost, taste, and ritual. That is to say, he can’t stand to spend money on anything he can do himself, enjoys the rustic nature of home-made wine, and enjoys getting his hands dirty (viz., the ritual) every September. If you’re serious about making your own wine, you’ll probably want to track down someone who has been doing it for a while and ask him/her if they’re willing to act as a mentor. In fact, I would probably recommend going over to the winemaker’s home and just watching for the first year (this way you’ll get a sense of the work involved and maybe get to taste a bottle or two of the wine and ensure that the homemade variety is to your liking <home-made wine is often very earthy and rustic and has a high alcohol content>). Homemade wine will also spoil over time, especially if sulfates are not used. Manual Grape Crusher – this device is used to crush the grapes and extract the first level of juice from the grapes. Ratchet Basket Press – a press is used to firmly squeeze any of the remaining juice from the grape and stem. 30 Gallon Oak Barrel – you’ll store your wine juice for fermentation in a barrel (some folks use glass or stainless steel, but in my view oak imparts some nice flavor). Note: a used whiskey barrel ought to be cheaper. 1-2 Large Plastic, food grade, Drum (with open top) – you’ll use the drums to catch the crushed grapes. Every winemaker has a different combination of grape varieties they swear on; my father uses a combination of Muscat, Zinfandel, Alicante, etc. (apologies for not divulging the full recipe) Needless to say, make a red variety if you like red and a white variety if you like white. My father’s recipe does have some white varieties in it and in turn he produces a light zinfandel (Rose) type of wine. 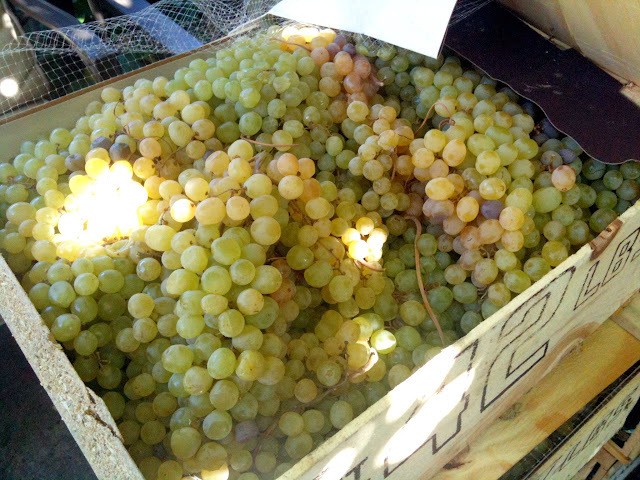 If you plan on producing 30 gallons of wine then you’ll need about 35-40, 36-42 pound, boxes of grapes. Living on the East Coast we’re privy to a pretty diverse population, so there are quite a few markets that stock grapes from California from September through October. Line up your plastic drums and get a hold of a few milk cartoons so you can place them near the base of the drums (two milk cartons per drum). 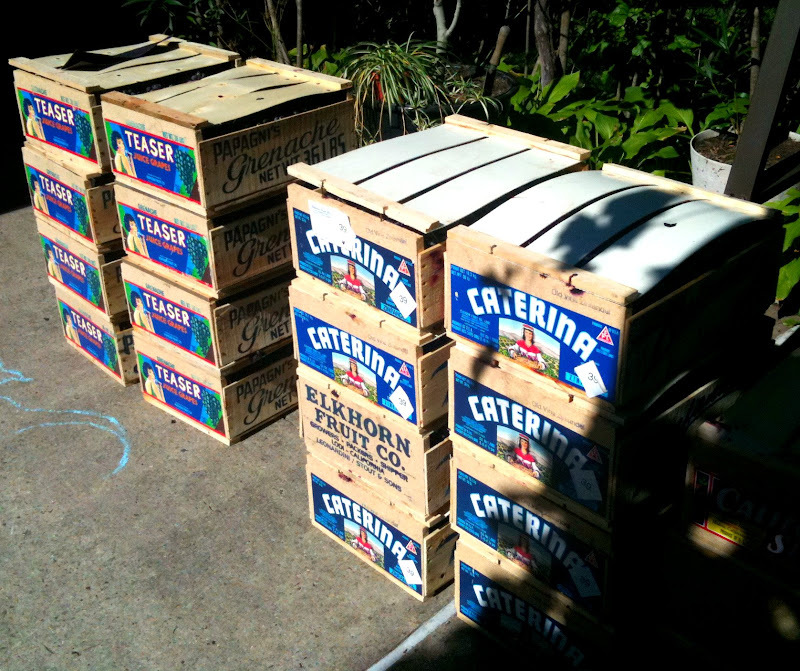 You’ll need the cartons to stand on so you can get some good leverage while you’re using your crusher. Place the crusher on the opening of the drum. You’ll need at least three men (one to hold the crusher, one to operate the crusher, and one to handle loading the crusher with the boxes containing the grapes). Crushing the grapes via a hand cranked crusher can be difficult so make sure you and your team swap with operating the crusher. Let the crushed mixture sit. Once the drums are full with the crushed grapes, you’ll want to let the grapes sit for a day or so; this will allow for the juice to settle to the bottom. On day three you’ll want to set up your wine press and begin emptying your plastic drums of the remaining grapes and stems. Load your wine press and gently begin squeezing the stem/grapes (you’ll probably get plenty of juice on the first couple of presses and thereafter the juice will diminish. The newly found juice should be returned to an empty drum. The pressing process will probably last the full day and requires some patience. The remaining grape stems/grapes (which at this point should be void of any juice) can be saved for making grappa (stay tuned for a post on grappa production) or thrown away (if you have a large property you can work into your compost pile). Time to transfer the grape juice to your oak barrel; this step can be messy but it’s all about a large funnel with a good strainer. Use your large buckets to move the juice from the drums to the oak barrel (it’s best to have a second person holding the funnel securely against the barrel opening). That’s it, most of the work is complete. You want to wait 5-10 days before plugging your oak barrel, but the majority of work is complete. If you do a search for other wine making techniques you’ll find many more steps (including adding wine yeast, bentonite, potassium metabisulphite, potassium sorbate, fining agents, or sulfates), tools/equipment, racking bottles etc., but the above process has worked for the Scordo family for nearly 35 years (at least here in the States and well over 150 years in Southern Italy). It’s important that the room housing your oak barrel has a constant temperature (say between 55 – 62 degrees) and that the barrel is not disturbed during the fermentation/aging process. My father lets his wine sit for about 7-8 months, depending upon the temepatuture during the early Spring period. Some folks let their wine age much longer in oak and this is fine if you have a temperature controlled environment or a proper wine cellar (with high humidity and the temperature range above). You can bottle your wine in individual 750 ML bottles (and cork the bottles individually) or find some gallon containers/jugs. Finally, it’s important that every piece of equipment used is extremely clean (so wash everything!). Over the long run making your own wine is very economical (especially in relation to buying cases of decent bottled wine); of course making your wine will not yield professional results or offer the variety that can be found in a well stocked wine cellar, but it’s a tremendous experience to share wine making with family and friends. Here are some photos from one of our homemade wine making weekends , including the bottling process. Aahh, this brings back memories. We went in with some friends to make our own Zinfandel. They had tried a batch of Cabernet a couple of years before and it wasn’t very good–they were ready to try again. The wine is drinkable, sort of. I guess the good thing is you don’t drink too much of it . . . But is very useful at this time of year, we use a jug of it to baste the holiday turkeys–boy is that gravy good!!! Needless to say, we still spend a lot of money on wine–the more drinkable kind! Hi Syd. Funny that you mention wine jugs, we used the same to store our wine! Making homemade wine is a love/hate type of thing. I really enjoy the process, but wish the end result was better! I use my homemade wine for sauces all the time! Your initial crushing what should i be looking for before i take them to be pressed?
. If you can shoot me an email i appreciate very much and thank you!!!! The photo of jugs brings back such wonderful memories. At the meal, my grandfather would pour his homemade wine into a little juice glass, then set the jug under his chair. Sincero ringraziamento gente. Se saranno i dettagli po ‘di più questa procedura anche meglio.